Melt the butter in a small skillet over medium heat. Add the onion and slowly soften, about 10 minutes. Meanwhile, mash the squash with an electric mixer in a large bowl. Add the eggs one at a time, beating for a minute or so after each addition. Add the onion and remaining ingredients (except the pumpkin seeds) and combine well. Turn the mixture into a well-greased pie plate or quiche pan. Add the pumpkin seeds to the hot, still buttery skillet and toast for 2 – 3 minutes. 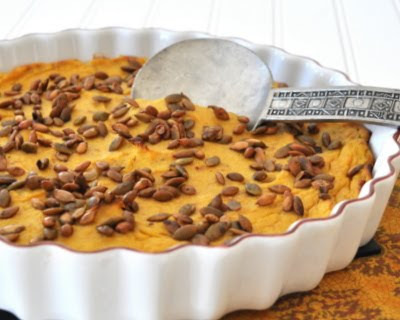 Smooth the squash mixture and sprinkle pumpkin seeds over top. Bake for 45 minutes or until a knife inserted in the middle comes out clean.